We are so excited to introduce you to Angus, one of our newest residents! If you’ve been following the local news these past couple months, you may have heard about the “mass execution of animals” at a nearby farm in Swanville that prompted Maine Animal Welfare Agents to exhume the bodies of several pigs who were shot and buried the day before agents were set to investigate cruelty charges, likely to cover up severe neglect. 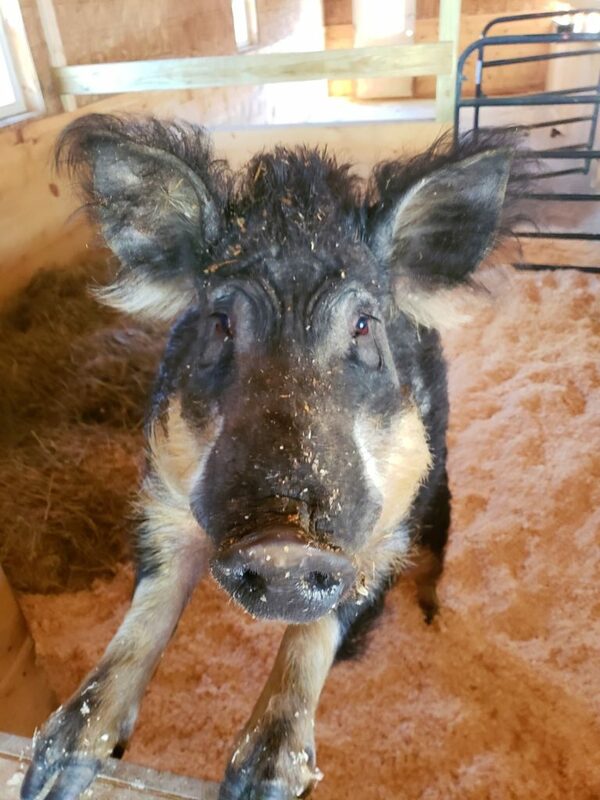 Angus was the only surviving pig on the property that day and he was seized by the Maine Animal Welfare program and was brought immediately to PRS. As his case was active and Angus was being held for evidence, we weren’t able to introduce you to our new boy… but as of Monday the state was officially awarded custody of Angus, who was signed over to PRS today! Additionally, the farmer was charged with 13 counts of animal cruelty stemming from the state’s investigation, which you can read about here. While our hearts are broken for all the animals who suffered and died in this horrific cruelty case, we are so glad that Angus will get to spend the rest of his life here in peace. Please donate today to help with Angus’ care and ensure PRS can continue to provide a safe haven for farmed animal victims of cruelty and neglect. Prev Send a Sanctuary Valentine!